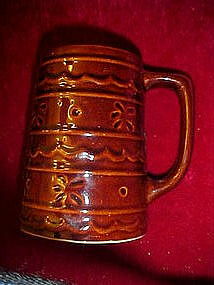 Nice large tankard size mugs by Marcrest in the daisy and dot pattern. Made of heavy glazed stoneware. Measures 5 1/4" tall and marked USA. I have three available, two are perfect @ 6.00 ea and the third has a slight crack at the rim. Still useable @ 3.00. Specify amount when ordering. I have other pieces in this pattern available also.